The coffee grinder is an essential piece of equipment found inside houses of coffee lovers. It grinds espresso beans into fine or medium grounds, suitable for traditional coffee makers. 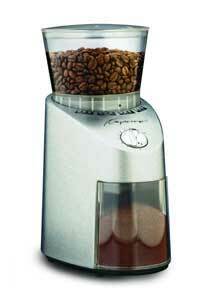 A coffee grinder is an important appliance for coffee drinkers. It grinds the beans for brewing purposes. It produces fresh and aromatic flavors of coffee. It can make fine or coarse grounds, depending on the user. It has become more popular now, tracing its beginnings in the old fashioned pestle and mortar. Top grinders, like the Capresso Infinity and the Baratza Virtuoso grind coffee into a removable receptacle. This is great for drip coffee and French press and still works ok for espresso. Other espresso grinders grind into a doser, for example the Mazzer Mini and the Rancilio Rocky. The doser is designed to catch and store the ground coffee until a dose of coffee is needed for a shot of espresso. This works great in higher volume espresso environments; just pull the dosing lever and a measured portion of coffee is dropped into your portafilter basket. Grinders with a doser are not convenient for drip and French press as they only dispense a little coffee at a time. The last group of coffee grinders is called “doserless”, the Pasquini K2 and the Rancilio Rocky Doserless are examples. Doserless grinders simply have a chute where coffee slides out into what ever you choose to catch it with. This makes them versatile for a range of coffee and espresso preparation. They also have a distinct advantage for the typical low volume home user, with a doserless model, you only grind what you need at any given time. The most elegant solution for espresso comes from Mazzer, the electronic doing grinder has all the advantages of a doserless grinder, but neatly measures the correct amount of ground coffee for the perfect shot of espresso.